Storm glasses have been used for centuries as a method for predicting weather. They consist of a special liquid inside a sealed transparent glass that changes based on upcoming weather. Our Storm Glass Crystals are gorgeously designed and crafted and predicts the weather with surprising accuracy. 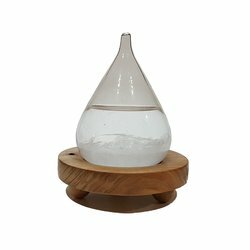 They are the perfect gift for weather or science buffs or just a beautiful desk decoration.